UVA-Wise Observatory represents one of the best science resources that our college has. Located in the upper, northeastern part of our beautiful campus, the new observatory offers an amazing opportunity to students, school groups, families and interested local citizens to see the wonders of the universe through the perspective of a telescope. Telescopes are not just “buckets” that collect light, offering brighter images of celestial objects, but they are also “time machines”, allowing observers to see distant sources of light, as they were hundreds or hundreds of millions of years ago. 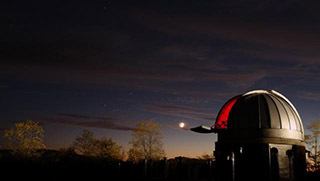 Local students and school kids, or interested people from the community can satisfy their scientific curiosity and passion for astronomy by visiting the UVA-Wise Observatory: planets and their moons, stars and deep sky objects (clusters of stars, galaxies and nebulae) are relatively easy accessible to observe. 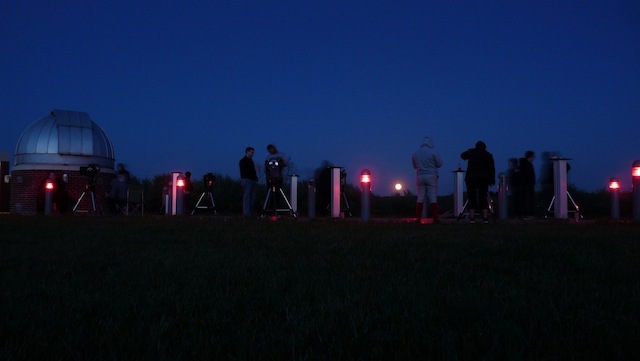 Motivating students, proving that natural sciences are meaningful and relevant for their lives is one of our most important missions, as educators - and the night observations of the sky are a wonderful way to stimulate and raise the interest in science. With the decommissioning of the old telescope as part of the Science Center renovation, a decision was made to build a stand-alone observatory on a darker part of the campus. Building a new observatory allowed us to install a 40 cm diameter, Schmidt-Cassegrain telescope. The new telescope was installed and became operational in early 2012. The observatory features a dome housing the main telescope, an observation platform equipped with six piers for mounting smaller telescopes, and a single-story, three-room storage building. The observation deck can be illuminated by two different sets of low exterior bollard light fixtures, some white, some red. The building complex has no connection to the utility grid and operates totally from a battery bank that is re-charged by a solar array. No current water or bathrooms are available on the site.